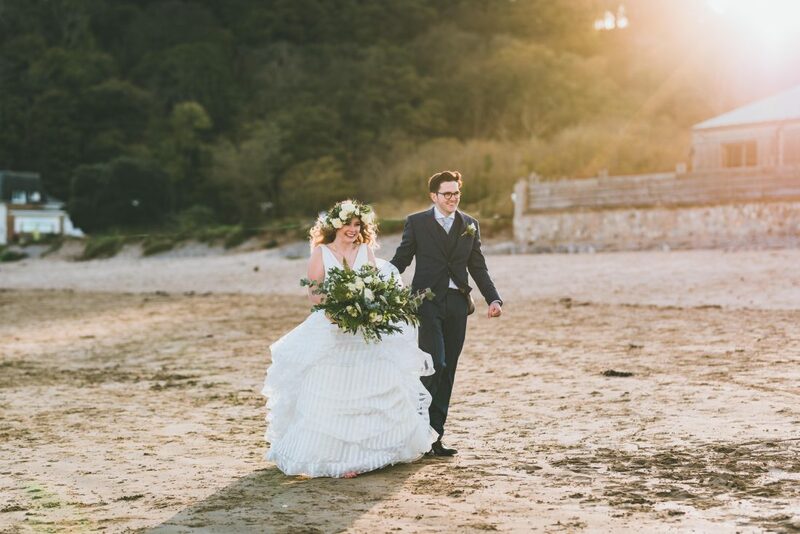 Eloise & James got married in the middle of a cold Autumn overlooking the stunning bay on the gower coast. Their Oxwich Bay Hotel wedding was stunning, intimate and personal filled with cycling and floral theme. Oxwich Bay hotel wedding venue on the Gower is one of those venues you certainly look twice at. Less than a few steps away, the lapping sea the hotel sits overlooking the entire bay. Nearby, Three Cliffs bay, one of the other famous majestic views of South Wales! Perfect for an autumn wedding with such amazing colours and star lit skies! Eloise the bride got ready surrounded by her bridesmaids and flower girls in the lounge area and bridal suite. As I arrived, hair and Make-up were in full swing and prosecco pouring ahead of the ceremony. James, the groom and his groomsmen all cozily getting dressed in one of the venues caravans nearby. A lint roller on hand to brush away the hairs from James’ Dog who was over sharing his fur that day. With the guys ready nice and early they chilled out and relaxed ahead of the events of the day. The bride almost dressed, guests arrived and all were poised and waiting for the ceremony to begin. I don’t think I’ve ever photographed a bouquet the size of Eloise’s for her wedding. During their pre-wedding photo session a few weeks prior, she did mention she was having a big bouquet but I didn’t quite expect the scale – certainly looked epic along with her floral headpiece. The music played and ceremony well underway. With readings expressed, rings exchanged and vows read, Mr & Mrs Coleman were married! It was straight up into the marquee for hot chocolates! Along the way their guests who were fist full of home grown lavender confetti ready to throw. The couple had grown the lavender months ahead and quite literally by the basket load. Having time to dust off, enjoy the company of their guests and carry out a handful of group photos at their wedding we had time to head to the beach! Woo… Brrrrrr! It was freezing! We made the most of the views and captured the bridal party on the beach with such magnificent views behind of the bay. All done in the quickest time as it was so cold, a cold arctic snap had blown over for the weekend to surprise us all. 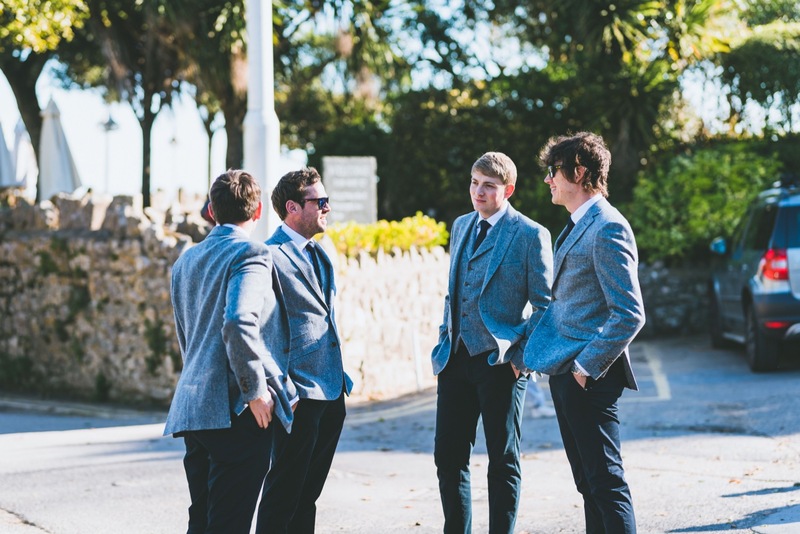 Eloise managed to borrow one of the groomsmen’s jackets to keep warm between photos – what a hero! Wish I could have done the same too. That being said, the photos are stunning which you can oogle at below. It was time for speeches and the 3 courses to arrive – food at the Oxwich bay hotel wedding venue is known as being rather special, they were in for a treat. I’ve photographed at the venue in all seasons now and this time of year is just stunning as during the time of this reception the sun is setting and the evening tones sets in as a backdrop to the top table. It sure was such a stunning day! One of the best parts of the day – The dancing… evening guests arrived and so it was time for the first dance and cutting of the cake. All before some serious dance moves was to be had on the dance floor. With the pressure of the vows and speeches over it really is a time to ‘let your hair down’ and relax and take it all in. The stars were incredible and very vivid that night, I found myself staring up for ages after I left late into the night. If you’ve booked Oxwich Bay Hotel and looking for a Gower wedding photographer, get in touch, I’d be delighted to hear off you and about your wedding plans!